Been diving in Bali? Please Vote! Bali is a rich and diverse land that is a must-visit for every diver regardless of experience level. It offers something for everyone both above and below the water’s surface and makes for an exceptional scuba diving holiday if travelling by liveaboard. Bali’s underwater landscape includes magnificent coral gardens, sheer drops into beautiful blue waters, world-famous wrecks and of course an abundance of diverse marine life to top it all off. Generally speaking, scuba diving in Bali is concentrated in three key locations – south, east and north east. Dive sites in this region are well-suited for adventure-seeking divers who have already logged a decent number of dives and have good experience with stronger currents. These pristine sites tend to offer sightings of impressively large underwater creatures such as the famous Mola Mola or Oceanic Sunfish. Dive sites in southern Bali are easily accessible from Kuta, a popular area with tourists and divers alike. Shore diving is extremely popular on the east coast of Bali, especially in the areas of Amed and Tulamben. Home to the well-known Liberty wreck, one of Bali’s most famous dive sites, the east coast also offers fantastic reef dive locations and muck diving opportunities. If you’re looking to escape the tourist traps of the south and east, a visit to the north east of Bali is unlikely to disappoint. Deep wall dive sites are plentiful around Menjangan Island and with medium to mild conditions and great visibility; it’s no wonder why divers of all experience levels try their luck at the numerous sites here. Although the reefs in shallower water have seen their share of difficulties what with bombing and storms, the reefs are gradually improving and the coral species are well on their way to fully restoring their health. Menjangan is within the proteted Bali Barat National Park. One cannot discuss dive sites in Bali without mentioning the crème de la crème of wreck dives: the USS Liberty. Certainly one of the most well-known and sought-after wreck sites in Bali, the 120m wreck is only located 30 metres from the shore of Tulamben Beach and is easily accessible for all divers. Originally hit by a Japanese torpedo, the wreck later underwent a volcanic eruption before settling into its place at the bottom of the ocean floor. In addition to large schools of brightly coloured fish, divers can hope to see garden eels, parrot fish and angelfish within the wrecked ship that has a rich history certainly worth exploring. For good visibility and the chance to watch the giant Mola Mola, head to the areas of Nusa Lembongang and Nusa Penida during the months of May to October. During this time the larger-than-life sunfish visit cleaning stations near the surface of the water and are often joined by giant manta rays looking to take advantage of this mass parasite removal process. Although visibility is generally very good, divers should be prepared for strong currents, difficult conditions and large fluctuations in water temperature as a result of thermoclines. For muck diving enthusiasts, look no further than Amed and Tulamben. Critters such as the mimic octopus, pigmy seahorse and ghost pipefish may all be located within the iconic black sand of Bali, so be sure to have your camera at the ready to capture interesting-looking creatures. Beautiful and exotic-looking mandarin fish come out to play just before sunset in the reefs surrounding the small town that is Pemuteran and are well-worth capturing on camera. 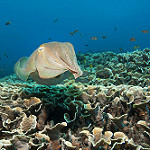 Bali’s dive sites offer exceptional diving experiences for all levels. There are exciting drift dives and shallow bays teeming with marine life. Here are some brief summaries of a few of the popular dive sites. The shipwrecked USA Liberty that was hit by a Japanese torpedo during World War II is near the beach at this site on Bali’s northeast coast. The ship rests at a depth of 3-29 meters and is covered with coral that is home to an extraordinary diversity of marine life. The wreck is easy to dive and can be snorkeled comfortably. Besides ship wreck diving, the three main sites located here on Bali’s northeast coast also offer shore diving, wall diving, night diving and deep diving. The bay at Tulamben receives rich plankton water from the ocean currents that move from the Pacific to the Indian Ocean, providing a diverse underwater ecosystem. This is one of the most recommended sites located on a small island in northwest Bali. It is part of the West Bali National Park, and only a limited number of divers are allowed each day. Jacques-Yves Cousteau said that this small island features more coral species than the whole Caribbean. There is a flat reef that extends about 20-30 meters before suddenly dropping to 30 meters, and there is a deep lagoon with a reef slope on the western end. The walls offer the best diversity of gorgonian fans in Bali that are full of fish. Turtles, barracudas, trevaily, batfish, parrotfish and groupers are home to this wall. Lucky divers can spot eagle rays, sunfish and even whale sharks. This is the largest of three islands located off the southeast coast of Bali and has a steep reef with visibility of 20 meters. Currents can become strong and change directions so advanced diving experience is necessary. The slopes and drop offs are covered with varieties of soft and hard corals filled with reef fish. 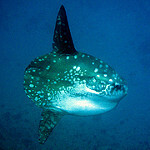 Big fish include manta rays, eagle rays, sharks giant turtles and sunfish. This small fishing village on the northeast coast of Bali subsists on salt panning. Coral gardens start right off the beach where there are woodpiles used for salt extraction. The reef is a field of staghorn coral and big schools of glass fish, making it Bali’s best snorkeling spot. Outside Jemeluk Bay there are two dive sites reached by boat with fantastic coral formations. 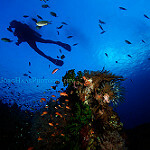 One of Amed’s dropoffs goes down 30 meters and is covered with soft coral. White and blacktip reef sharks patrol the area. A sandy field at a depth of 27 meters is a highlight. Dives here are very comfortable. Macrophotographers are attracted to this site on the northwest tip of Bali. This is a shallow dive with no rich coral formations, but it is rich with rare marine species including nudibranches, dragonets, eels, seahorses, scorpion fish and frog fish. Luckily for diving and travel enthusiasts, Bali is easy enough to get to. The international airport, Denspasar Airport, is a busy port that will allow travel into and out of Indonesia. Diving is possible year-round in Bali, however most divers will choose to visit during the months of May until November. Diving conditions do vary between the seasons, but divers can expect average water temperatures of 26°C to 30°C and air temperatures between 25°C and 35 °C. Visibility is generally in the range of 10-60m and currents can vary from non-existent to very strong depending on the location and tide. Many dive centers are based in Sanur, just a short drive from the main airport. These companies will offer packages such as diving safaris and trips. On the east coast, divers are spoilt for choice when it comes to dive resorts in Amed or Tulamben and should easily be able to find suitable accommodation and services for their diving adventure in Bali. Feeling inspired and raring to go? Check out our Bali travel guide and start planning your next diving trip! Diving in Candisdasa is great. Diving in Menjangan Island is great. Diving in Jimbaran is great! Diving in Kubu is great! Diving in Nusa Dua is great. The Blue Manta Liveaboard is a spacious ship designed to deliver a comfortable Indonesian diving experience. Hi, I would like to book a PADI open water course for tomorrrow. Is there any available and is it 3days? Hi there do you go to manta point amd cristal bay tomorrow? Do you have any trips planned on Monday for Manta point? Hello Greg here. I’m going to on holiday in Denpasar Sept 18th- 28th. I am a certified diver and will be wanting to book multiple dives. My girlfriend is looking to try fun diving or possibly even getting certified while there. Please let me know if you have any questions. I will be staying in Bali at Kupu Kupu Jimbaran on the 16th & 19th October and I wanted to enquire about diving. 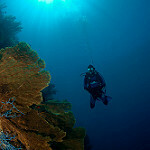 I am keen on diving at Nusa Penida plus one additional location. we are Padi Certified, we have completed 8 dives, 3 non-certified (discover Padi) and 5 certified dives. I’m Lucie, I’m coming next week to Bali on vacation with family and friends and would like to explain you my situation. I’m a Padi instructor and worked in 2014 as freelance in Bali. This time I come only for holidays, and would like to make the Open water to my cousin and my friend. 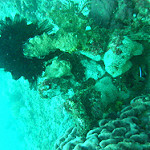 I have been diving some times in Padang Bay, mainly in Blue Lagoon and Jetty. I wanted to ask you if you would accept me to do the Open Water course to my 2 family members. –	And then boats and tanks as there is no diving from shore at Padang Bay I think no? We would arrive on Sunday 22 (maybe we beging the swimming pool on Sunday afternoon and/or Monday morning) and leave on Wednesday afternoon, so we would dive on Monday afternoon, Tuesday and Wednesday morning. Can you please let me know if that would be possible, and if yes, what prices to rent all of this? We are a couple from Holland. We would like to take a PADI Open Water diving course.in November. We have done two fun dives in Holland, but other than that we are total beginners. We would prefer to start our course on tuesday the 28th. Could you contact us to tell us about the possibilities. We would love to here from you. If you send me an email, i’ll send you all the details and options. 2 guests want to snorkel for Manta Rays. Good day I was wondering if you can offer me with info about 2 people diving price foe a day trip with two dives. also we need a refresh learning about diving last time I did scuba diving was May 2016 my friend last time was march 2009. We are a group of 7 people, 5 divers and 2 non-divers. We want to explore the Bali dive places. Arriving around 26/27 octobre till 9 november. We like to dive in Menjangan and around Tulamben, maybe also a few dives in Nusa penida. What can you offer us ? We are interested in diving in Padangbai and adjacent sites, particularly the sites Blue Lagoon/Ferry Channel, Jetty – Tanah Ampo, Tulamben (Liberty wreck), Amed (Japanese wreck). We have a special interest in muck diving and rare species such as the pygmy horse. We are 47 and 53 years old, both have PADI Rescue Diver certifications, Nitrox speciality, >180 logged dives, last dive 07/2018. We are currently in Ubud and will take a shuttle bus service to Padangbai on Monday 6th 7am, so shall arrive for the first dive in the morning. We would appreciate if you could send us quotes for diving packages for 1-2 days diving (4-6 dives) including equipment rental (we have own masks and computers). Very much looking forward to your response at your earliest convenience. my name is Michael, I’m 29 years old and an Underwater Photographer and Divemaster with about 400 dives. I will be in Padangbai from 26th of August to 28th on my way to Nusa Lembongan. So unfortunately I will just have time to do one day of diving in the area of Padang Bai – two or three dives on the 27th. that’s the main reason why I wanna stop in Padang Bai. I have never see them and they are by far my favourite animal in the macro world. Would there be space to dive one or two of these sites on the 27th, so day after tomorrow? And what would be the price? I have all my own gear and an active PADI Pro status. may i know if there is fun dive on 27th Oct ? I am Open Waters certified, last dive was in Feb 2018. I would need to rent equipment and camera and pay in IDR.